One benefit of having a tower boat skiff is that when the water clears it allows me to see where the fish are on the flat and in the holes. Monday was no exception as I had a couple of minutes to scan over certain spots to see if they were holding fish. Low and behold, one spot had a big pile of snook and a few redfish. After picking up my clients we went into that spot first. It did not disappoint, as Rusty hung two snook of 10-15 pounds and lost one at the boat as I had scaled down my leader to 25lb and the big snook wore through the leader with his sandpaper- like jaw. I should have known better, From now on, its 30lb. leader or bust. 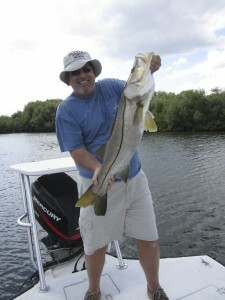 My clients really had their sights on redfish, but this day was all about snook, really big snook. 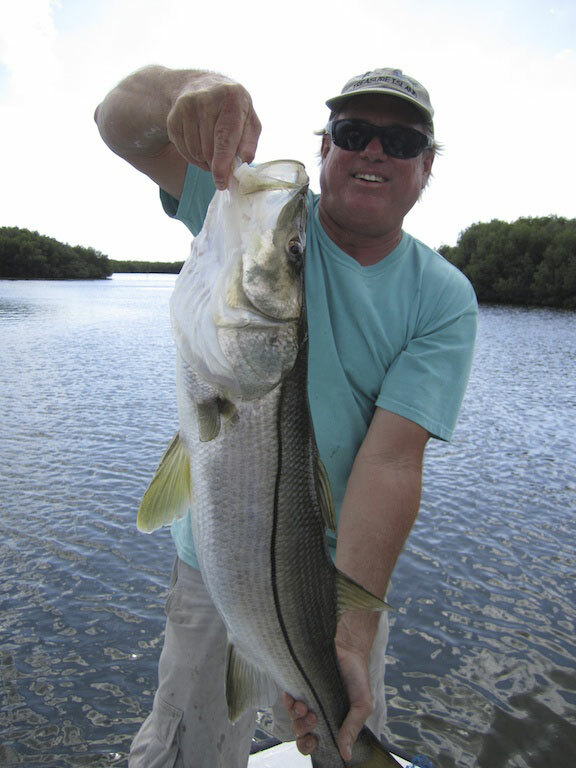 Sometimes it just works that way, and if they were a little upset with me, it was a good disappointment because it’s simply not every day one hooks and catches a twenty pound snook. This day they hooked 4 in my estimation were 18-20 pound fish. 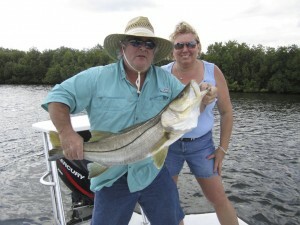 I hope they don’t get snook fever because that will mean many, many sleepless hours, in pursuit of those big fish again. I do not know why, but I think the snook closure of a couple of years after that dreadful winter sometime back, has allowed the few remaining survivors to grow to large size. Not the huge 25 pound hogs, but the nice 20 pound pigs. What I see these days are more of the big breeders than even the little scooters of 2-4 pounds, which should mean good breading seasons and future proliferation of the species. In reflection all Terry really wanted was a nice 5 pound redfish, but all she kept hooking were those dang 20 pound line siders. I wish we all could have such bad luck! It’s a good thing husband Patches was around to help out, as he turned out to be quite the angler in my view, a real quick learner. Yep, some days you may not get what you wanted, but you may get a surprise of a lifetime indeed.